Be one of the first 10,000 fans and receive The Play Bobblehead. All Bay Area fans know this. All Cal fans love this. I want this. What a great bobblehead to commemorate the craziest play in college football. So earlier in the day, Cardale Jones tweeted this. Some speculated that he would announce his entry into the NFL Draft. Some hoped that he’d stay at Ohio State. His stock is really high so leaving for the pros made sense. He then held a nationally televised press conference for his announcement. After letting the events of last night sink in, I can now fully appreciate the beauty of this new playoff system. If we were still under the BCS rules, Ohio State wouldn’t be champions. In fact, they wouldn’t even have a chance at the title. This is what I think the college game needed and we got a great taste of why it was a success. One of the things that makes college football’s new system great is the chance for teams to prove that they are deserving of a title shot despite not being ranked at the top. I wonder if the playoff will expand in the future. But for now, we got a great glimpse of what goodness can come. Ohio State proved to me that their defense was phenomenal and their running game controlled the entire tempo. 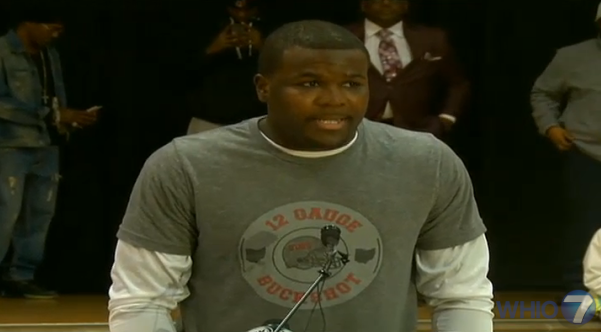 I am was thoroughly impressed with Cardale Jones and his poise despite his lack of prior playing time. 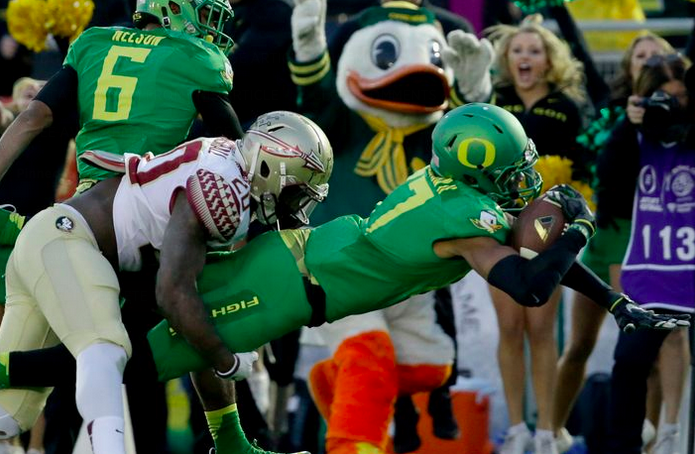 The Oregon offense never got a chance to get into a good tempo and as a result they just look baffled on the field. Even though it wasn’t that close, I was hooked watching this game and I know that a part of it was because I witnessed the two games on New Year’s Day and wanted to see its conclusion. Good job, NCAA. You got something right. Now don’t mess it up going forward. The U left Nike to sign with Adidas and Snoop Dogg may have given us a glimpse of what their new jerseys could look like. They look terrible. I know Snoop has brand loyalty to Adidas, but he seriously can’t think this is good looking, right? The College Football Playoff made its debut yesterday and even though there is one more game left, I consider it a complete success. The one issue that the BCS created was the possibility of several worthy teams that should be considered for the championship game were left out. It was not fair and it didn’t bring any excitement. After all, just selecting two teams as championship contenders instead of having teams fight for the right was downright silly. What we got yesterday was a glimpse of the future. There might be an expanded playoff in the future, but this final four approach works. We got the four best teams in the country in a playoff to determine who is the champion. Last night the Seahawks ran a play that looked really similar to something we’ve seen. The Auburn Tigers posted this to remind everyone where the read option pass play came from. Following the game, Pete Carroll acknowledged the origin of the play. Great play. Surprised that it’s taken this long for teams to full embrace plays that succeed in the college game. Farewell, BCS. You weren’t a great system and at times, we questioned why you exist. But you gave us great games. The BCS Championship game we just witnessed was an amazing game. Texas-USC was amazing. The Rose Bowl this year was fun. Boise State’s upset was phenomenal. But it’s time for you to go. I bid farewell, but I also thank you for the good and bad times. We learned a lot and had a lot of fun watching these games. To the new playoff system, we expect great things. This is why we love college football.